Women's Designer Celtic Necklace : LOVE2HAVE in the UK! This designer Celtic necklace is the stunning rose silver collar for women with modern contemporary styling that is a combination piece of sterling silver and minerals. This time we feature purple amethyst and red garnet. The silver parts themselves consist of roundels and chains. 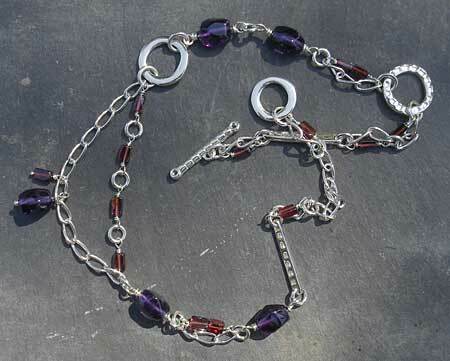 The red garnet beads come subtly incorporated into the silver chains. The fastening is a T-bar arrangement with a lovely textured bar to complete the overall design. 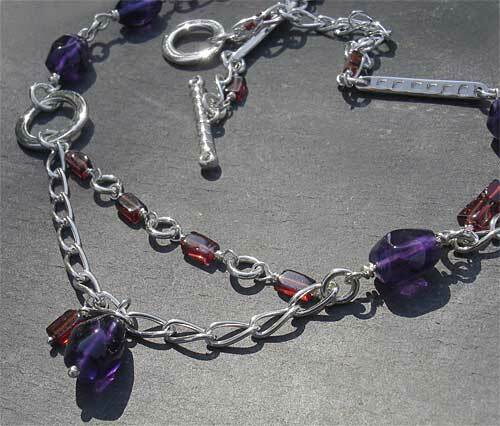 The total length is 16 inches and matching earrings and bracelet are also available making a beautiful collection of silver jewellery featuring the rich tones of purple amethyst and red garnet on a silver chain.